Skirda, Alexandre. 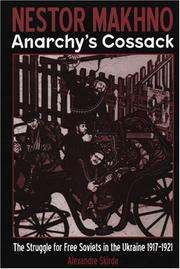 Nestor Makhno – Anarchy's Cossack . AK Press: 2004. 11 + 415 pages. Translated by Paul Sharkey. The phenomenal life of Ukrainian peasant Nestor Makhno (1888–1934) provides the framework for this breakneck account of the downfall of the tsarist empire and the civil war that convulsed and bloodied Russia between 1917 and 1921. Makhno, a formidable and daring strategist, headed an army of anarchist insurgents—a popular peasant movement which bore his name. Mahkno and his people were fighting for a society "without masters or slaves, with neither rich nor poor." They acted towards that ideal by establishing "free soviets." Unlike the soviets drained of all significance by the dictatorship of a one-party State, the "free soviets" became the grassroots organs of a direct democracy - a living embodiment of the free society - until they were betrayed, and smashed, by the Red Army. More than just the incredible exploits of a guerilla revolutionary par excellence, Skirda weaves the tale of a people, and the organizations and practices of anarchism, literally fighting for their lives. 9781902593685 Not currently available. Find at a local library. Makhno, Nestor and Alexandre Skirda. The Struggle Against The State And Other Essays .